What is its bill weight? While the first 2 elements above are relatively straightforward, the third is more complicated. 1. How fast will it travel? Amplifier provides several Carrier Services for our Clients, who decide which options to offer their Customers. Cost increases with speed of service. Amplifier’s current Carrier and Service offerings can be found here. 2. How far will it go? Carriers divide the world into Zones based on the shipping point of origin. Generally, the farther a destination is from the point of origin, the greater the number of zones, and the greater the corresponding freight cost. Carriers provide tools for calculating the Zone based on the Ship-to Postal Code. For International Shipments, the Zone is based on the Ship-to Country, and, for some Services, the Zone is a combination of Ship-to Country and Ship-to Postal Code. 3. What is its bill weight? This element is a little more complicated and is important to understand. The best way to see how costs behave is to ship actual shipments from Amplifier to different destinations. Estimates may be incorrect. The Actual Weight of the Container is the same as the container’s mass (in pounds). The Dimensional Weight of the Container is indirectly related to the Container’s Volume (in cubic inches). The Bill Weight is the greater of Actual Weight and Dimensional Weight. The Bill Weight, as listed in the freight tables, will drive the cost. Be advised: UPS, FedEx, DHLeCommerce have distinct ways of calculating Dimensional Weight. And these practices are subject to change over time. Note that a container that is 1 Cubic Foot (1ft x 1ft x 1ft) is assessed as 11 lbs. for UPS Domestic Shipments and DHLeC International Shipments, and 12 lbs. for UPS International Shipments and all FedEx Shipments. Thus, if you are shipping a pillow that is 1 Cubic Foot, it will be assessed as an 11- or 12-lb. shipment, even if it’s actual mass is only 0.5 lbs. As you can see cubic volume sometimes matters a great deal to freight cost. To know the cubic volume of a shipment, you must know what container it will ship in. Amplifier’s best-in-class WMS helpfully assigns packaging to each shipment via a process known as Containerization. How will a shipment containerize? Shipping Container selection is an automated process that occurs at the time of shipping. Amplifier has a standard set of Containers available for Client Shipments. Shippable-As-Is: Is this item already in a container that meets Carrier requirements and, if so, will it ship separately that way? Packing Class: What is the minimum container type requirement? The Containerization process works through each attribute to arrive at a suitable Shipping Container. Make sure that the weight of the item doesn’t exceed the tolerance of the selected Container. If it does exceed the tolerance, find the next biggest Container in the Packing Class which can tolerate the weight. Note: Most items are not Shippable-As-Is (the exceptional items are below), and typically the Item Category isn’t needed for single item Shipments. Multi-Item Shipments are more complex. If one of the items has a Box Packing Class, but the other items have the Bag Packing Class, the Box Packing Class will be used. The list of Packing Classes is an increasingly exclusive list: if it goes in a Box, it cannot go in a Bag; if it goes in a Stay-Flat, it cannot go in a Box or a Bag; if it goes in a Tube, it cannot go in a Box, Bag, or Stay-flat. Once the correct Packing Class is determined, the size of the Container is found by combining the total volume of the items, finding a Container where both the total volume of the items can fit, and then confirming that the L, W, or H of each item can fit into the Container. If the L, W, or H exceeds the Container, the next largest Container is selected that will fit all three dimensions of each item. For example, a Shipment may include a 8 x 4 x 1 shirt (32 cubic inches), a 6 x 5 x 4 mug (120 cubic inches), and an 10.25 x 1 x 1 car flag (10.25 cubic inches). The total volume of these items is 163 cubic inches (0.09 cubic feet). By volume, this will easily fit in the 10 x 8 x 5 sized box (400 cubic inches, 0.23 cubic feet), but the car flag’s Length dimension, 10.25, is longer than the Length of the box, so this Shipment will containerize in a 12 x 9 x 6 box (648 cubic inches, 0.37 cubic feet). From a Dimensional Weight perspective, it is an additional pound of weight, 3 lbs. to 4 lbs., to move from one container size to another. Long and Narrow, a rolled poster doesn’t have much Volume, until you decided to ship it with a non-poster. Do that, and you’ve gone from a 24x3x3 (216 cubic inches) container to something like, at a minimum, 24x3x6, doubling the Volume, and increasing the exposure to Dimensional Weight. For this reason, when Amplifier receives an Order containing a Poster and a non-Poster, we split the Poster and the non-Poster into two different shipments. The Poster shipment containerizes in a Tube, and the non-Poster item into it’s appropriate container. 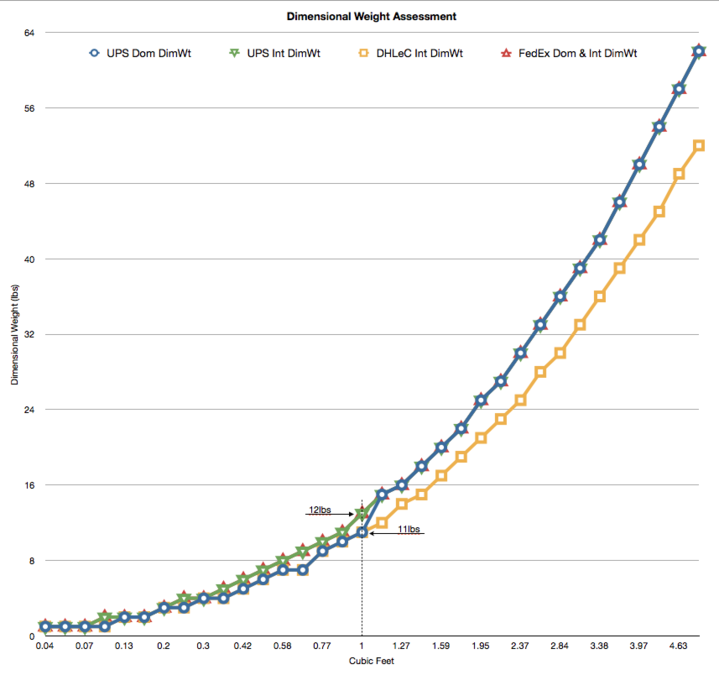 On average, these two Shipments will not trigger Dimensional Weight, and will only be billed on their Actual Weight (lb). If there are multiple Posters in an order, all Posters will allocate to the same shipment, and go in the same tube. 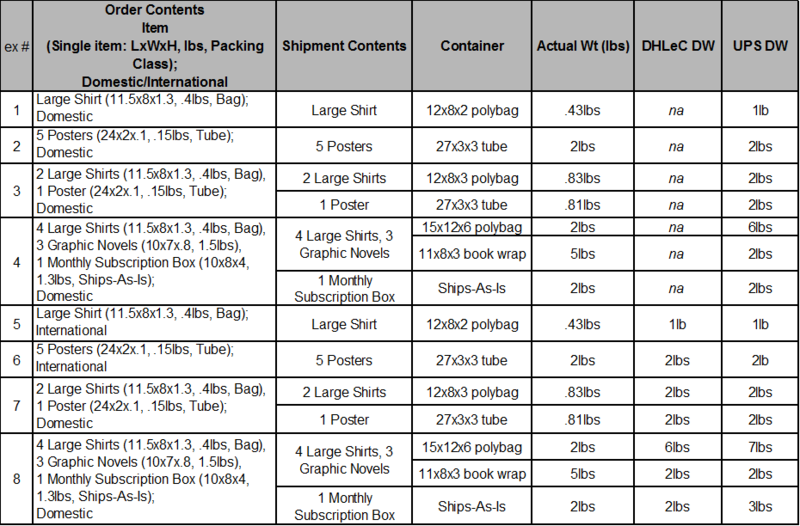 If there are multiple non-Posters in an order, all non-Posters will allocate to the same shipment (provided the non-Poster is not a Big Thing, below). Creating two shipments from one Order means there is an additional Shipment and Container fee, but, on average, the additional fees are less than the additional Freight incurred for a Shipment that is volumetrically large and triggers Dimensional Weight. Posters are unique in that only they containerize in Tubes, but other items can also be big enough to need to break them apart into distinct shipments from smaller items. For example, Items like Big Pillows, Puffy Jackets, and Skateboard Decks can easily trigger Dimensional Weight when anything else is added to them. Our rule of thumb is that, if the item itself is already 1 Cubic Foot in volume, or, if adding another item from the Client’s catalog will regularly push the entire shipment over 1 Cubic Foot in volume, we will set that item to ship in it’s own shipment. Books ship in boxes, but may incur damage if they are only packed in boxes with Amplifier’s standard void-fill. Paperback books are especially prone to corner-dings, but even hardback books can get a bit crumpled. We also have found that no matter how well we pack a 11-lb. box of books, dropping a container of books with that total weight will damage its contents. To mitigate against these kinds of damage, Amplifier uses a corrugated wrap and limits the cumulative weight of the container to 10 lbs. This means that a shipment with five 3-lb. books will containerize into two containers, each using the special book wrap, of three and two books. Some items are packaged from the vendor in such a way that Carriers would accept the item as-is. If a Shipment contains both a shippable-as-is item and a standard item, the standard item will containerize using the standard logic, and the shippable-as-is item will be treated as it’s own, separate, container: one shipment, with two containers. However, if your catalog has some large items that could trigger Dimensional Weight, some items that only ship in a box, books, or some other unusual attributes, you will need to establish what your recurring Order profiles are and calculate Freight for each Order profile, rather than try to have one average estimate. Combo Orders (two shipments, one in a Bag and another in a Tube). As always, please Contact Client Service with questions. Item dimensions, weights, and Packing Classes vary by actual items. Available containers and Carrier Dimensional Weight calculations are subject to change.